The Coalition Government is risking incensing cross-party MPs after dismissing calls to ban the use of wild animals in circuses, and effectively ignoring the Commons Debate and unanimous call for a ban in June, says Animal Defenders International (ADI). In reply to a Parliamentary Question tabled by Justin Tomlinson, Conservative MP for Swindon, Secretary of State for Environment, Food and Rural Affairs Caroline Spelman restated the Government’s controversial decision to opt for a licensing system that will allow circuses to continue using wild animals under certain standards, therefore ignoring the will of the House to ban their use before July 2012. Please take action today to help make animal circuses a thing of the past. Write a letter and send immediately to Defra’s Secretary of State, Caroline Spelman MP, Nobel House, 17 Smith Square, London, W1P 3JR. Tell her that you are outraged with the government’s decision not to ban animals in circuses. Emphasize that a licensing regime is costly, very difficult to enforce and that it will not ensure the welfare of wild animals in circuses. Urge her for this decision to be overturned. Contact your MP immediately and tell them that Defra has announced that it will not ban animals in circuses and to take action urging the Minister for this decision to be overturned. Write to them at: The House of Commons, London, SW1A 0AA. Organise weekly leafleting sessions in your town or city. Please contact us and we will provide leaflets free of charge. Once a month hold an information stall in the market or in the high street. Please contact us and we will provide leaflets, posters and also loan you our banners, inflatable elephant and stall equipment, such as backdrops and tables, and even assist you on the day if needs be and time permits. Organise a demo during the circus season. Please contact us for further details. Donate to ADI. By donating to ADI campaigns you will enable us to expose cruelty and suffering. Without your donations towards ADI’s work, animal abuse will continue unchecked. Please help us by giving whatever you can - the animals need your help. You can donate online here. Mr Tomlinson MP said: “There is no doubt that the nation would like to see an outright ban on the use of wild animals in circuses. "I therefore strongly urge the Government to introduce a ban rather than a system of licensing to fully prevent animals from languishing in circuses across Britain, as demanded by the public and many MPs." This latest development comes after a string of unsubstantiated and inaccurate claims made by Defra, with the Minister Caroline Spelman being under constant scrutiny since being appointed over a series of embarrassing U-turns on flagship proposals including the decision not to ban wild animals in circuses. In a previous Parliamentary debate, Defra Minister Jim Paice MP also had to admit that his department had made inaccurate claims about the legality of a circus ban, having cited a legal challenge in Austria that was exposed by ADI as not being in existence at that time. The Minister has also claimed that banning wild animals in circuses would be illegal under EU law and may also be in breach of the Human Rights Act. ADI has published expert legal opinion that categorically states that there are no legal obstacles to a ban. Defra has failed to respond to ADI on these points, and has refused to publish the legal advice that it had received to arrive at its flawed decisions. Tim Phillips, ADI’s Campaigns Director said: “This recent announcement is just the latest in a series of undemocratic manoeuvres from a department ignoring the decisions of Parliament and the opinion of the public, when it should be listening to the will of the country. An ADI investigation into the winter quarters of Bobby Roberts Super Circus this year revealed a staggeringly high level of violence and serious animal husbandry flaws. Incidents included Anne, an elderly, severely arthritic 57 year old elephant, being hit with a metal pitchfork and kicked around the face and body 48 times over the period of observation by workers, who are also seen beating and spitting on a camel and beating miniature ponies and horses on numerous occasions. ADI’s exposé of the horrific abuse of elephants at the Great British Circus in 2009 put wild animals in circuses back on the political agenda, and their evidence was presented to Government which helped prompt a public consultation on animal circuses in December 2009. 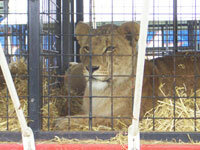 National measures to prohibit or limit the use of animals in circuses have already been adopted in Bolivia, Austria, Belgium, Czech Republic, Denmark, Estonia, Finland, Hungary, Luxembourg, Peru, Poland, Portugal, Slovakia, Sweden, Singapore, Costa Rica, India and Israel and similar laws are being discussed in Brazil, Chile, Colombia, and Greece.